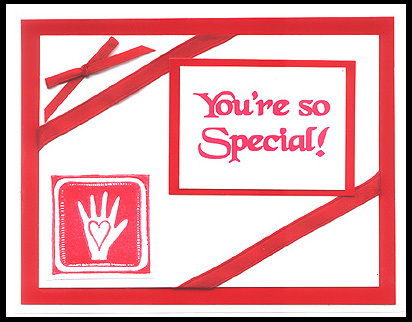 You’re So Special & Follow Your Dreams! 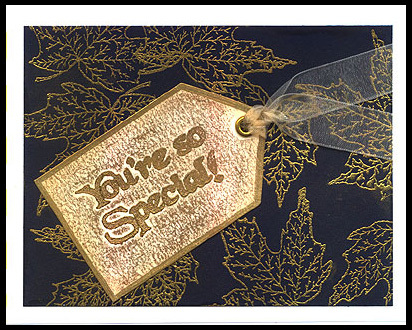 “You’re so Special!” and “Follow your dreams!” are stamped in black on white card stock. “Leafy branch, Lg.” is stamped at an angle and “Leafy branch, Sm.” is stamped twice appearing to come from off the panel. “Three Bunnies, Sm.” is stamped twice with three of the bunnies showing one time and only two showing the other time. The panel is sponged with orchid and sky blue pearlescent ink, layered on black card stock and attached to a blue card. “Bold Block – Celestial Bunny” is stamped in black on white card stock, layered on black card stock and attached overlapping the edge of the panel on the card. 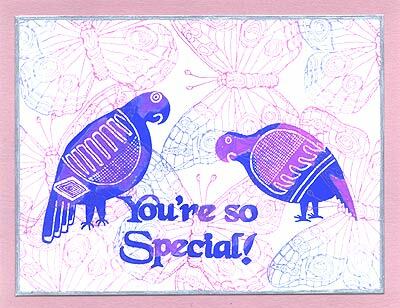 The card measures 4″ x 8 1/2.” Card by Margaret Wiggin. Tags: Bold Block Celestial Bunny, Follow your dreams!, Leafy Branch Lg., Leafy Branch Sm., Margaret Wiggin, Sea Sponge, Three Bunnies Sm., You're So Special!